Raise your hand if financial conversations make you feel uncomfortable? You wouldn’t be the only one. Many of us feel awkward when the discussion turns to money, and some of us do all that we can to escape it. Hiding behind mistletoe and retreating to the kitchen are popular tactics of the season used by the fiscally shy, but these escape routes are more harmful than you might realize. If you want to arrive in the New Year with your finances intact, keep reading to learn the best ways to talk about money during the holidays. The holidays are an expensive time of year. The latest stats project the average American spends more than $900 on the season, and this figure doesn’t even consider the cost of hosting in-laws from out of town or the price of a turkey that can feed 20. Once you add every expense, the true cost of the season can far surpass a grand. Try as you might to cut money out of the season altogether, the delights of the holiday rely on cash. Without it, you can’t decorate the house, fill the fridge, top up wine glasses, or wrap the presents. To pretend that it doesn’t exist when you’re spending it left, right, and center is a dangerous tactic, and it can lead you to overspend. Once you start relying on credit cards and cash loans to fund the holidays, you’ll be paying for the festivities months into the New Year. The latest study by MagnifyMoney finds the average American adds $1,003 of debt during the holidays, and nearly half of them will take more than four months to pay it off. There’s no such thing as blissful ignorance. Eventually, your overspending will catch up with you, so it’s important you make financial conversations a priority this season. That doesn’t mean you’ll be wanting to leave it until you’re enjoying pumpkin pie at the family get-together. Not only is it too late by this point to be of any good, but do you really want to hear your Uncle Steve’s opinions on your financial situation? There’s a time and place for every discussion, including the internal ones you have with yourself. 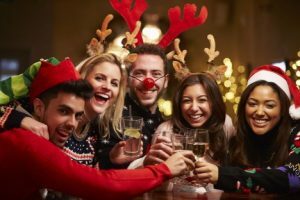 Months before the holidays start, you should be thinking about your financial reach and how much you can realistically spend on the festivities. This means you’ll to draft a budget before you can really understand the scope of your finances. Don’t let this extra step scare you off. With the help of great finance resources, you can find money-saving tips on how to budget on even the tightest budgets. Next up is the out-loud conversations you’ll have with your immediate family and anyone else you’re expected to exchange gifts with. If there’s going to be a drastic change in the number of presents your kids can open this year, don’t let them discover the surprise on the big day. Without going into specifics, let them know that you’re going to be spending less money on the holidays and explain how that will affect your celebration. As for the adults, bring up gift ideas like a family Secret Santa exchange, so you aren’t expected to buy several gifts for each member of your family. This way you only have to focus on one present for one person and keep your cost low. If you have burning questions about borrowing money from family, discuss things away from the dinner table, when people aren’t held hostage by the joint meal. This also pays off in your favor, as you’ll have a private conversation with only the person whose opinion you value. The season’s full of family get-togethers, so use one of these smaller ones as the time to ask your parents or cousin if you could borrow money. If they show signs of being uncomfortable themselves, postpone the talk until after the busy season is over. Solid though this advice may be, not everyone in your family will abide by the same rules. If you’re cornered by Uncle Steve when he asks how much of your student loan or cash advance you’ve paid off, don’t feel like you have to answer his question. Change the subject diplomatically by suggesting you should talk about it later. This is one of the rare times when it’s appropriate to slough off a conversation about finances, but don’t let your awkwardness stop you from following the rest of the advice above. Make a point of thinking and talking about money with the people you love. It’s one of the only ways to avoid financial mistakes during the holidays.